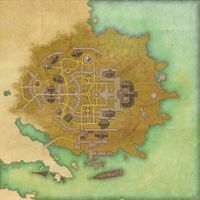 Skywatch is a city at the eastern side of Auridon. 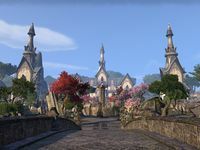 The city is built around an ancient ruin and is a very prominent port for the Aldmeri Dominion. It is ruled by High Kinlady Estre. 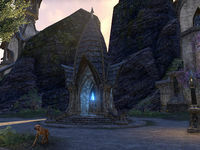 Skywatch Objective: Help Razum-dar defeat the Veiled Heritance at Skywatch. Assisting the Assistant: Gather some parts to repair an Argonian's pet Dwemer construct. Mud Ball Merriment: Celebrate the New Life Festival with the Bosmer of Skywatch. The Racer: Win a race with a frog. Spirited Away: Help a mother bring peace to her children by praying at their graves. The Skywatch Wayshrine can be found outside the city gates to the west. Various Dwemer containers can be found in Skywatch, around the Dwarven Centurion display. Looting from them is considered stealing, but they do have a chance to contain Dwemer style motif chapters. This page was last modified on 20 February 2019, at 03:08.